This versatile clay has many benefits for the skin and body. Contains: montmorillonite and illite green clay. Preparing a clay paste: Pour the desired amount of clay into a container. Gradually add water and stir until paste is the desired texture. Leave to stand for about half an hour. - As a beauty mask: Apply clay paste thickly on the face and neck, avoiding the eye area and lips. Leave for about 10 minutes without letting the mask dry on the skin. Rinse with warm water, and dry skin with a towel. Moisturise afterwards. - As a poultice: Place the clay paste on a natural fabric and spread with a non-metal spatula to a thickness of 2-3cm. Place the poultice on the skin and hold loosely in place with a bandage. If the poultice is to be applied to an irritated area, insert a thin gauze between the clay and the skin. Leave for at least one hour. Remove as much clay as possible, if necessary using water, then rinse the skin with warm water and dry with a towel. - In the bath to soften the skin: Pour 1-2 tablespoons of crushed clay into a glass of water, stir, and add to bath water. Can be used on its own or mixed with other products. 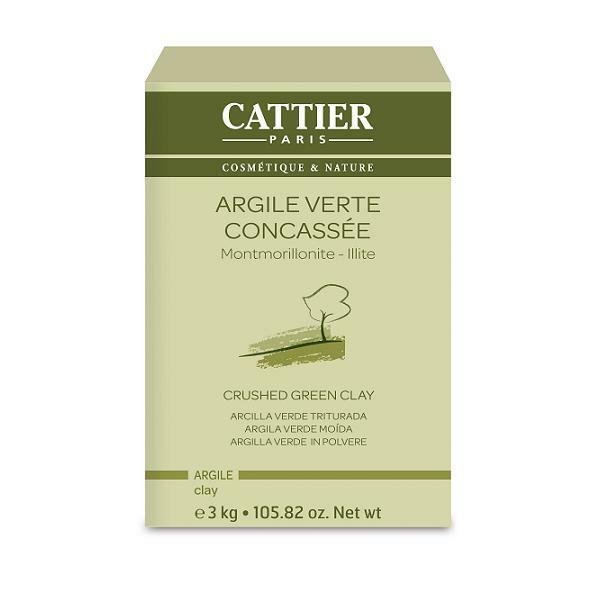 Cattier is a French company who produce natural and organic cosmetics, created in 1968 by Pierre Cattier. Cattier cosmetics are natural, gentle, and effective. They are formulated with natural ingredients partly produced by organic farming methods and do not contain parabens, phenoxyethanol, synthetic colouring or fragrance. Cattier is therefore registered as member of the Cosmebio association. This guarantees eco-friendly production methods which do not use pesticides, weed-killers, chemical fertilisers or GMOs.